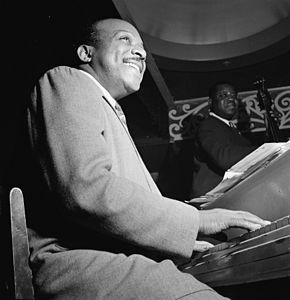 William James “Count” Basie (1904 – 1984) was an American jazz pianist, organist, bandleader, and composer. Basie started in the arts at a young age after dropping out of school. He soon learned to operate lights for vaudeville shows and improve accompaniment for silent films in Red Bank, New Jersey. By this time, he was committed to playing piano exclusively, having previously been a drummer as well. Basie moved from New Jersey to Harlem where we reconnected with a childhood friend, Sonny Greer, the drummer in Duke Ellington’s band. Harlem was a hotbed for jazz and provided Basie the opportunity to connect with the greatest jazz musicians of the time. Basie joined Bennie Moten’s band in Kansas City and played with them until Moten’s death in 1935. He also played piano and co-arranged with Eddie Durham. “Moten Swing,” credited to Basie, is widely acclaimed and was an invaluable contribution to the move towards a freer form of orchestral jazz and the development of swing music. In 1935, Basie formed the Count Basie Orchestra, which he led for nearly 50 years. This orchestra is credited for creating innovations like the use of two “split” tenor saxophones (most bands had only one), emphasizing the rhythm section, riffing with a big band, and using different arrangements to broaden their sound. Many of the members of his orchestra grew to prominence due to his direction. Basie also showcased some of the most notable blues singers of the era including Billie Holiday, Jimming Rushing, Big Joe Turner, Helen Humes, and Joe Williams. His most notable songs, including “Jumpin at the Woodside” and “One O’Clock Jump,” will forever live on as some of the most well-known jazz standards ever created. Basie has won nine Grammy Awards and four of his compositions (“Lester Leaps In,” “Everyday (I Have the Blues),” “April in Paris,” and “One O’Clock Jump”) have been inducted into the Grammy Hall of Fame. Notably, Count Basie was the first African-American male to receive a Grammy award. In 1985, President Ronald Reagen posthumously awarded Basie with the Presidential Medal of Freedom. In addition, the National Recording Preservation Board in the Library of Congress included Basie’s “One O’Clock Jump” into the Nation Recording Registry.